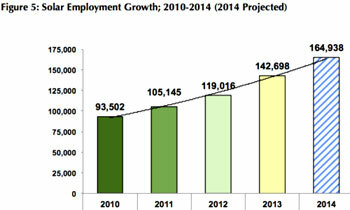 The annual census of US solar jobs is in – and as of 2013, the industry now employs about 143,000 Americans. That’s an increase of almost 20% from 2012, says The Solar Foundation, which conducts the National Solar Jobs Census. With the addition of 23,682 solar jobs, employment grew 10 times the rate of the national average of just 1.9%. During the same period, jobs in fossil fuels declined by 8.7%, shedding 8500 positions, according to the Bureau of Labor Statistics. The solar industry now employs more than the coal and natural gas industries combined, according to the National Green Energy Council. Over the past four years, the solar industry has added nearly 50,000 well-paying jobs, and another 22,000 are expected this year too. The vast majority of solar jobs are in manufacturing and installation – 70%.